I have always enjoyed making food for my kids. So much so that I ended up making all of both Aiden and Alder's baby food. Yes, it was time consuming and I spent many nights after they were in bed mashing, blending and steaming vegetables, but it made me feel good knowing what went in to their little bodies. 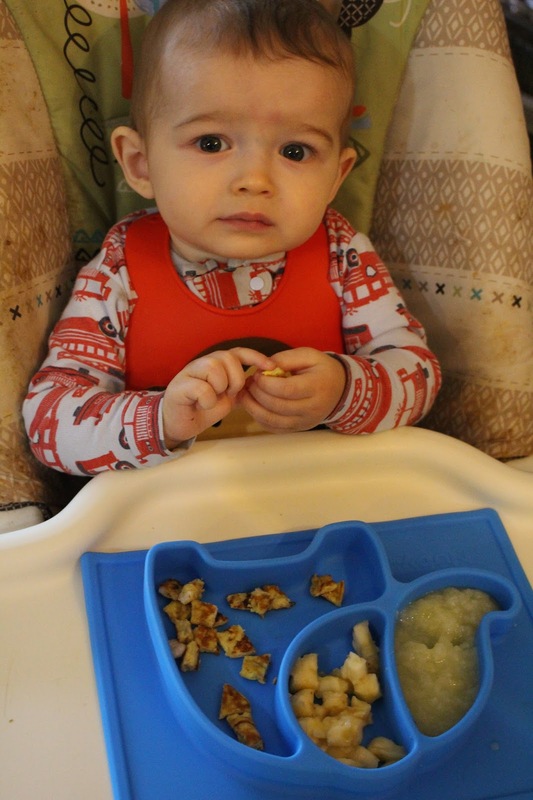 Now I'm feeding an almost one year old and a toddler and I find that to be much harder for some reason so I thought I'd share a few no fuss products and meals that have been helpful for me with a toddler and a little one "just beyond the baby phase." *Sidenote: All of you Mamas out there who have little ones who just eat whatever you eat, congratulations, but that does not describe my children, hence this post. Haha. Someday that will be my life. A divided plate that sticks to the table or high chair tray. The one pictured above is from Nuby. When your child can start feeding themselves everything changes. My 11 month old is an eating machine and he is also very opinionated about food so I like to have several options for him on his plate. He is also the messiest eater EVER, I'm talking he should get a bath after every meal, so a plate that sticks to his tray is high on the priority list. I also have this version for my toddler. You guys, why did I not ever purchase one of these bibs when Aiden was little? Why?! Being able to simply wipe a bib clean is amazing. I also love that he can't pull this bib off like he can with the velcro bibs we have. The bib Alder is wearing is also from Nuby and is inexpensive for how durable and convenient it is. You can also roll it up to fit in a bag to take on the go! He also got a Bella Tunno bib from Santa. They cost a little more, but are very trendy and have cute quotes and sayings. -2 ingredient pancakes-THIS IS MY GO TO KID FRIENDLY BREAKFAST. I make these at least 3 times a week and both kids will eat them! They are so easy that my toddler can whip them up (literally). -Avocado/Banana Yogurt (Plain Yogurt + mashed avocado + banana) Freeze this to make a great popsicle! *This website has been an amazing resource for healthy food ideas for my kids! I did receive the pictured products for free in exchange for my honest review. All opinions are my own. Such great ideas and he is so cute!